Jeremy Corbyn was on a campaign visit to Morecambe ahead of May’s local elections. He joined local Labour candidates in launching their manifesto on Saturday with pledges to tackle poverty, act on climate change and invest in housing. Coun Darren Clifford, who was part of the working group which drafted the plans, said: “This manifesto builds on Labour’s many local successes over the last four years, achieved in the face of crippling funding cuts by the Conservative Government which have seen the council’s funding slashed from £15m to less than £6m. “These include the fantastic development of Salt Ayre Leisure Centre, investment in CCTV, tackling fly-tipping and anti-social behaviour, improvements to council houses and work to prevent homelessness. We have also shown real leadership in working with communities to confront climate change, oppose fracking and respond to flooding – including through new prevention schemes in Morecambe and on Caton Road. “These exciting plans draw on more than 16,000 conversations Labour activists have had on the doorstep with residents since the general election – something we do more than any other party. Labour currently runs Lancaster City Council, but with a majority of just one going into the election on Thursday, May 2. The manifesto pledges to fight poverty - with sitting councillors having already committed to maintaining support with council tax for low-income families and a new one-year post for a public health project coordinator to tackle food and fuel poverty, health inequalities and social isolation. Clean streets and safety are a priority, with extra resources to be put into tackling dog poo, fly-tipping and other anti-social behaviour. There is a focus on ‘empowering communities’, including a commitment to consulting widely on new proposals for Lancaster’s Canal Quarter scheme. The manifesto says a Labour-led council would look at serving a compulsory purchase order on the owners of the derelict Frontierland site in Morecambe - to enable the council to buy the land and facilitate a community-led development if progress is not made soon on stalled plans for a retail development. 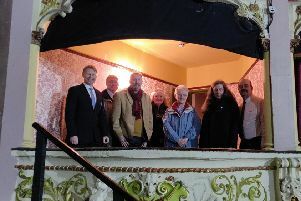 It highlights Labour’s support in principle for the proposed Eden Project North in Morecambe, as well as support for arts and leisure, independent traders, the creative and digital sectors and ‘community wealth building’ to help ensure money is spent locally by the council and businesses so it benefits local people. Labour will lobby to ensure Lancaster remains a stop on the new HS2 trainline between London and Scotland, and for the Carnforth spur to be built to improve connectivity to Leeds. The proposals include further investment in council houses, a commitment to protect them from being sold-off and work to develop a publicly-owned housing organisation that would help expand affordable and socially rented housing. A district-wide landlord licensing and rating scheme would be developed to ensure every rented home is properly maintained and fairly let. A Labour-run council would seek to work with other councils in Lancashire to explore setting up a local energy company to ensure residents pay less for their energy while using renewable sources of power. It would also talk to neighbouring authorities about establishing a regional bank which would support refurbishment of older homes, helping to make them more energy efficient and cutting bills. Both proposals form part of Labour’s action on climate change,which will build on a move by sitting Labour councillors - which secured full council support last month – to ensure the council is carbon-neutral by 2030 and convene a ‘citizens assembly’ to help develop plans. Other environmental commitments include working with residents and businesses to reduce single-use plastics and increasing use of solar energy on council land.